Intergenerations is a project was financed under the EU Youth in Action, finalized to create new partnerships and project ideas on the theme of dialogue and solidarity intergenerational. Was held between 13-20 March 2013 in San Cesario di Lecce. 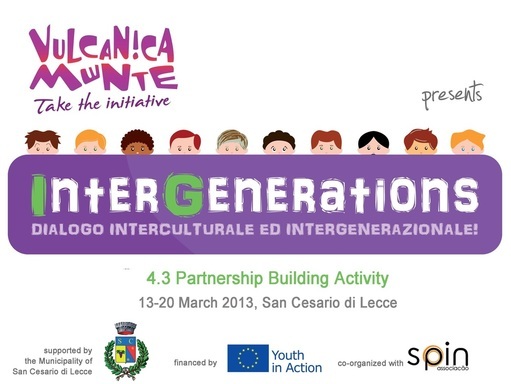 VulcanicaMente, an association of social promotion that among the different purposes promotes intergenerational and intercultural dialogue in a perspective of growth and mutual exchange, in partnership with 9 European Associations . Participants came together in San Cesario di Lecce, where for a week reflected through methodologies of non-formal education on the theme of intergenerational dialogue.